In a given state of technology when the units of variable factors are increased with the units of other fixed factors, the marginal productivity increases, it is called law of increasing returns. At least one factor of production is assumed to be indivisible. Some factors (labor and capital) are assumed to be divisible. There is a scope of further improvement in the technique of production. There is no change in the prices of factors of production. All units of variable factors are equally efficient. In the light of above assumptions the following schedule is presented for law of increasing returns. In the above schedule, the units of variable factors (labor and capital) are employed with fixed 10 units of land. The producer goes on expanding his business by investing successive units of inputs, and then marginal productivity goes on increasing up to the fifth unit of the variable inputs. At the 5th unit, the plant is working to its full capacity and it is not possible further to reap the economies of large scale of production. Thus the total productivity increases at increasing rate. In terms of cost, the law of increasing returns means the lowering of the marginal costs as industry expanded. So, by increasing returns, we are moving towards the optimum business unit. 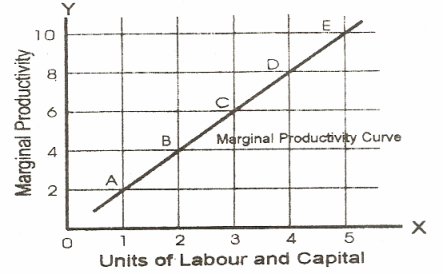 The units of labor and capital (variable inputs) are measured on X-axis, while marginal productivity of these inputs on y-axis. By schedule we have taken A, B, C, D and E points in the figure above. By joining these points we get the desired marginal productivity curve of increasing returns to scale having positive slope. Factors of production are combined and substituted up to some extent. An industry is expanded by getting the internal and external economies of large scale of production. The law is also applicable in that unit which is producing below its capacity. The increase in marginal returns continues till the plant begins to produce to its full capacity. The principle of specialization is applicable in industrial units The marginal productivity increases due to specialization. In industrial sector human factors are more involved than natural factors. Due to this reason natural obstacles are less effective. Therefore the law of increasing returns operates in an industry to increase its output and the price of the product falls.